Chow mein is the ultimate fast food, making it an ideal after-work meal. Sally shares her delicious recipe for this classic stir-fried noodle dish, which can be cooked and on your table in just 30 minutes. Noodles, along with long beans, are traditionally eaten at Chinese New Year, as the long strands symbolise longevity for the year ahead. The preparation of the noodles is generally up to personal preference, as long as the noodles are not cut or broken as this would signify shortening of life, which would definitely not be a good start to the year! 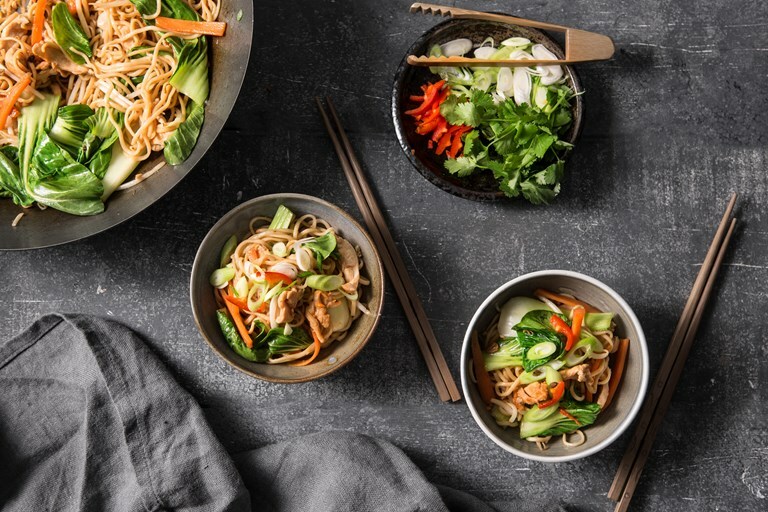 Chow mein, which translates as 'crispy noodles' is mostly associated with greasy Chinese takeaways, but when freshly made at home it makes for a quick, easy and tasty meal. There is much speculation as to the exact origins of the dish, with all regions of China seeming to have a claim, but given its simplicity and interchangeable ingredients you can see why it is hard to pin down. You can substitute the chicken for prawns or just keep it vegetarian if you prefer, and the vegetables themselves can be swapped for whatever you have available, I sometimes add broccoli or celery to mine. If you and your dining companions fancy a bit of a kick, finish the noodles with a generous sprinkle of chopped fresh red chilli to turn up the heat.